There's a special kind of rage that bubbles up when facing cheap AI in a fighting game. As Shao Kahn or Gill or that jerkface Rugal beats you to a bloody pulp, it takes every ounce of restraint not to put your fist through the screen; anything to wipe that smirk off their digital face. But even at the height of cheapness, almost every fighting game AI behaves like an Agent from The Matrix: fast, aggressive, and bound by rules; rules that can be exploited. Because of this, the idea of an AI consistently beating a skilled, human player is about as likely as getting a new Darkstalkers game (read: impossible). They can't strategize, and improvise, the same way a human mind can, and therefore rely on overpowered moves and gimmicky tactics as a crutch. However, there are some - from big companies to intrepid individuals - still searching for smarter AI, and what they've discovered may give the CPU its first fighting chance in a long time. One path to a better AI relies on the player to become both teacher and sparring partner. Killer Instinct's shadows system - announced earlier this year - seeks to recreate your fighting style with an unprecedented degree of accuracy. According to Bruce Hayles, an engineer with Iron Galaxy, "Everything your shadow does in a fight is something you've actually done before. If you never block while training your shadow, then it will never block. If you historically stop [attacking] on wakeup after repeatedly being punished, your shadow will adapt in the same way." Astute fighting game fans know Killer Instinct isn't the first to offer something like this. From Virtua Fighter 4's AI training to Super Smash Bros. for Wii U's amiibo integration, tailoring an AI has been done before - just not very well. But while these attempts have caused an AI to use some of your tactics some of the time, the Killer Instinct team wants your shadow to be instantly recognizable as a product of your own habits. It intends to recreate your movements step for step, and blow for blow, serving as a digital representation of you on your best day. "When you play against your shadow, it can get really spooky," says James Goddard, design director at Microsoft Studios. "I guarantee at some point when you're fighting your shadow in a mirror match, you're going to do a move at the same time as your shadow. The two will trade hits, and you'll be like 'Whoa.' Bruce and his team have created what may eventually become Skynet. It really gets in your head." "Traditional AI can be fun and challenging, but in many ways you're playing a different game compared to fighting another human." Shadows are created on a per-character basis, meaning you have a Jago shadow, a Sabrewulf shadow, and so on. You train them individually, either by fighting against them or by uploading gameplay data generated from fighting other AI, shadow, or human opponents. The impact this data will have on your shadow can be previewed using the shadow brain (shown above), which outlines your general fighting style. Data is also recorded on a per-matchup basis. This way, your shadow knows to use different strategies against the slower Chief Thunder, than it would against nimble Riptor. Once your shadows are in top form, you can send them out into the net to fight for you. Should another player defeat your shadow, a 'shadow bounty' will be placed on that player's head, incentivizing you to personally step up and defeat their shadow in retaliation. You can also face down several shadows in succession in a special survival mode that pulls in increasingly difficult digital doppelgangers from online. "There's definitely a nostalgia for the super hard AI of the '90s," says Hayles. "The traditional AI can be fun and challenging, but in many ways you're playing a different game compared to fighting another human. It's the difference of fighting what the developer wants you to fight, versus the unpredictability of a live opponent." By creating an AI that's constantly updated by human input, the Killer Instinct team hopes to finally bridge the gap between these two styles. Eric "Dantarion" Sheppard, one of the leads on Project M, shares this nostalgia. Around this time last year, he unleashed KenBot upon the world, a souped-up Street Fighter 4 AI that falls on the far end of the spectrum from KI's shadows. Armed with inhuman reflexes, a frame-perfect knowledge of each attack, and an unlimited supply of Shoryuken!, KenBot took on all challengers in a YouTube series documenting his online exploits. The lucky few who survived are able to recognize the bot's patterns and exploited them accordingly - the Achilles' heel of all AI. Since posting those videos, Sheppard has been working on ways to inject more humanity into his creation. "KenBot would love to think like an actual person," he explained, "but right now he's coded on hard rules. He's told the best way to play the game." 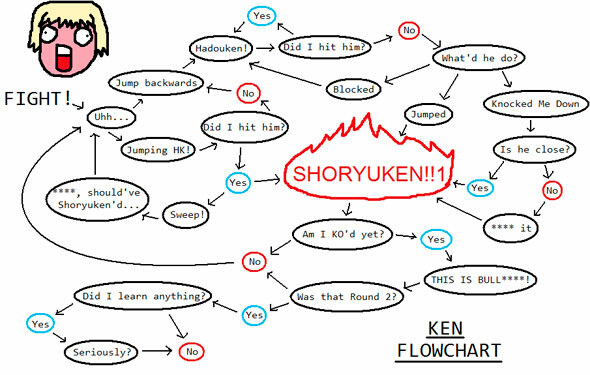 That 'best way' comes from the legendary Ken flowchart, the obvious pinnacle of Ken Masters mastery. Sheppard (perhaps blinded by hubris) believes he can improve upon perfection by rewriting the bot with expanded decision paths and possible combo strings to make it less of a one-trick pony. If his AI is going to beat humans, after all, it should at least act like one. "We now have match data from millions of SFIV players from around the world. We're thinking about how to utilize this data in the future." With an expanded repertoire, plus the ability to interpret hit- and hurt-box data, Sheppard feels confident about taking his creation on the road. Next stop: EVO 2015. "I want him to crush people outright," he boasts. Hearing him describe his setup from the show, Sheppard sounds like something of a carny for the digital age. 'Step right up, folks! Step right up and face the mighty KenBot!' All of the data recorded from these matches will then be used to make KenBot even stronger. But Sheppard isn't the only one looking to beef up Street Fighter's AI. Yoshinori Ono, producer on Street Fighter IV, and the team at Capcom are working on their own designs for a new versus CPU. "In the Street Fighter IV series, we implemented a Replay Channel starting at SSFIV, which is a playback feature that allows players to view matches," Ono says. "As such, we now have match data results from millions of SFIV players from around the world. Moving forward, we’re thinking about how to process and analyze this data and utilize it in the future." By Ono's own admission, the basics of how fighting game AI operates "hasn't changed much since the Street Fighter 2 days." A versatile, well-designed AI can be a valuable asset to any fighting game. It can be a teaching tool that helps players better understand a character's fighting style, or instill the confidence they need to jump from CPU battles to online matches against live opponents. This is something Ono sees as a major opportunity, and something could shape the future of Street Fighter. "Versus fighting games are ultimately a form of entertainment, a [game] built on the PvP model," he says. "We're looking into how we can create that essential AI that urges players to jump into the VS arena, as well as how we can create an AI that provides the type of entertainment that makes players feel the joy of battle. At the core, this is what I feel our goals are. Regardless of which diverse background you come from, at the end of the day, everyone wants to get better and stronger, right?"